↑ "Maharshi Dhondo Keshav Karve | Taluka Dapoli". www.talukadapoli.com (in ଇଂରାଜୀ). Retrieved 2018-07-01. 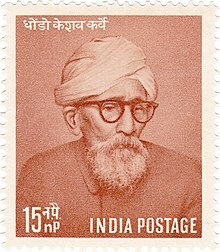 ↑ "Remembering Maharshi Karve, the man who set up India's first university for women". India Today (in ଇଂରାଜୀ). Retrieved 25 August 2018. ↑ "महर्षी कर्वे मराठी प्राथमिक शाळा – मुरुड". talukadapoli.com (in ଇଂରାଜୀ). Retrieved 2018-07-01.